The Guild’s guest speaker told us of his great joy when, walking one day, he espied a lady who possessed an unusual knocker. He offered her £3 for this collector’s item and she was thrilled to be able to unscrew it on the spot for him. He said he happily left a knockerless lady holding in her hand his three £1 notes. Did we think he had robbed the lady? It’s the 1950’s, and Dolly and her husband Chas are now Grocers and Provision Merchants. Owning a shop was a childhood dream of Dolly’s, though it wouldn’t have happened had Dolly’s rice puddings been a little better. 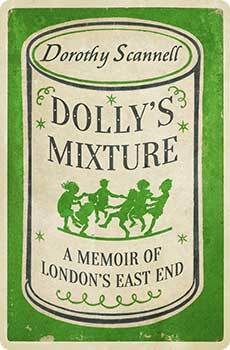 And it is at this relatively advanced age, amid the continuing adventures and misadventures of Dolly’s eccentric and hilarious family, Dolly finds a best friend for the first time in her life.